A small town in north-central Texas that was founded in 1846. The town is named after General Sidney Sherman, a leader of the Texas Revolution of 1835, during which Anglo settlers in northern Mexico attempted to secede from the Mexican nation. 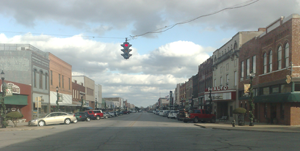 Sherman was established as the county seat of Grayson County and developed as a center for commerce, services, and industry. "Sherman-Denison metropolitan area, Texas, November 25, 2009" by Kennethmyers is licensed under Public Domain. People of Darkness (03-06), p. 175. 2010 Sherman, TX. Handbook of Texas Online. http://www.tshaonline.org/handbook/online/articles/hds03, accessed April 23, 2015.